If you follow conventional wisdom, the San Jose Sharks have returned to being one of the better teams in hockey. However, they are also a team with notable concerns and there has been no shortage of people pointing them out. Two major weaknesses are cited these days. One is the backup goaltender and the other is the depth on the blue line. Both are false concerns, though in unexpected ways. People have commented on the Sharks’ lack of defensive depth and vulnerability to injuries. The Sharks’ blue line carries seven players. This group includes the Sharks’ core five starters: Marc-Edouard Vlasic who partners with Justin Braun, Paul Martin who partners with Brent Burns, with Brenden Dillon as the fifth member. The Sharks record when missing one of their core five blueliners is 1-6-2, having given up 37 goals in those nine games. Yet this result is heavily skewed towards early in the season. Eight of those nine game occurred in the first 27 games of the season, only one has come in the 26 games since then. Things have changed. Dillon’s current partner is rookie Dylan DeMelo. DeMelo took the starting job from Matt Tennyson in early December, 26 games ago. For the first 25 of those games, the Sharks rolled out the same six defensemen, a streak broken against Calgary on Thursday night. The coaches trust DeMelo and he has developed his game substantially. In the 26 games since taking the starting job, DeMelo has yet to score at even strength. His four points (2G/2A) have come on the power play. DeMelo is minus-2 in this 26-game span. His contributions have been modest, but he has not been a major liability. DeBoer is still not fully bought into DeMelo. His ice time has topped 15 minutes just three times, and two of the three were in blowouts. Tennyson is the Sharks’ seventh defenseman. When he has been in the lineup with the Sharks’ core group of five starters, Tennyson is plus-5. Tennyson’s minus games have mostly come when paired with Mirco Mueller, who is currently a work in progress in the AHL, and in the first two games of DeMelo’s NHL career, early in the season. Overall, Tennyson is a respectable plus-1, even with the pairings he has had. In the Sharks’ most recent game against Calgary, DeMelo and Tennyson were paired together. They were the only defensemen to have a plus game. The Sharks began the season with a major question mark at the sixth defenseman spot. With the respectable play of Tennyson and the development of DeMelo, they have two viable solutions. DeBoer has little confidence in Tennyson. The numbers tell a far more positive story. DeBoer has seven NHL defensemen, even if he doesn’t believe it. If the team needs an eighth d-man, there is trouble. The team could look for an upgrade prior to the trade deadline. I’d be surprised if that isn’t happening. Still, this is an area where the weaknesses seem to be exaggerated. A backup goaltender has three major responsibilities. The Sharks’ backup goaltender is Alex Stalock. 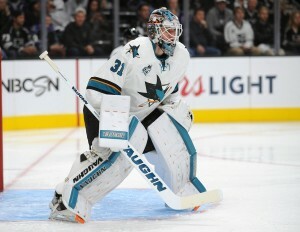 In the 2013-14 season, Stalock excelled and as a result, earned himself a two-year deal as the Sharks’ backup goalie with a chance to overtake Antti Niemi for the starter job. Stalock’s 2014-15 was a far cry from his promising prior season. This season has been worse. On the first responsibility, Stalock has neither failed or succeeded. 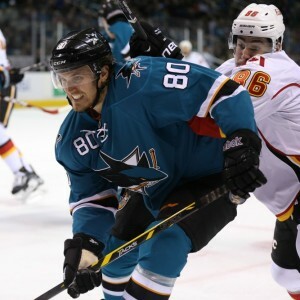 In the games he has come in, the Sharks had already allowed more goals than they would score with one exception. That game, Stalock would save 20 of 21 and the Sharks would lose by one goal. Hard to suggest he didn’t give his team a chance, even as he was credited with the loss. Overall he is 0-1-0 in that scenario, the loss coming in a game he had over a .950 save percentage. On the third responsibility, starter Martin Jones has been healthy all season, so Stalock has never needed to fill in for a stretch of games. His record is 0-0-0. The primary role Stalock has had this season is covered in point No. 2, playing occasionally. On that, the results are clear. They are not good. As a fill-in starter, his record is 3-4-2. The Sharks have scored 35 goals in Stalock’s nine starts, to come away with just eight points is disappointing. In the six losses as a starter (two in the shootout), Stalock’s save percentage has been below .900 each time, below .850 in five of the six. Still, the case can be made that the most important job is actually the third responsibility. On that front, results are hard to come by, but at least they project to be positive. I’ve seen it suggested on social media that when Stalock plays with frequency, his numbers are substantially better. That can be quantified and those observations hold true. When Stalock has played a second game within a week of the initial game, I call it a ‘proximity game.’ So far this season, Stalock has played in six proximity games (one of the six games followed an AHL appearance). The difference in his play between proximity games and all other games is massive. In proximity games, Stalock’s save percentage is that of a top-five starting goalie. In all other games, that save percentage is not compatible with holding a job as an NHL goalie; it isn’t even close. The Sharks should make the postseason despite Stalock’s play. That is the key. If the Sharks lose out on the postseason, Stalock’s play will be a focal point. As of now, the Sharks sit in second place in the Pacific Division. They are solidly in a playoff spot now, with several more points plus games in hand over the teams most likely to challenge them for a playoff spot. A playoff spot is theirs to lose. The playoff seed is almost irrelevant. Not long ago, there were even comments that finishing second in the division might be better than finishing first, due to specific first round match-ups. It is possible the Sharks will call up a goalie from their AHL team, the San Jose Barracuda. That will not change the fundamental issue with the backup goalie. The Sharks will ride Martin Jones as far as he can take them, both in the regular season and in the postseason. DeBoer indicated that when he recently stated “I had Cory Schneider in that position, and I think I started him 20 games in a row in New Jersey.” Stalock (or a potential call-up) likely has only a handful of appearances left in the regular season. Come the playoffs, assuming Stalock remains the back-up, he will only be used in mop-up situations or in case of an injury. The latter is the one scenario where he has the best chance to help the Sharks. Stalock has been a problem for the Sharks this season. Yet it is a surprisingly manageable problem, given the Sharks current needs. It would not come as a surprise if the Sharks attempt to upgrade either the blue line or the backup goaltender spot. There will be players on the trade market that are better than the Sharks have. However, current conditions have made it clear: neither blue-line depth or backup goaltending are a major dilemma for this team. At this point, the Sharks would be wise to wait until close to the trade deadline to make a major move in case a more pressing issue emerges.